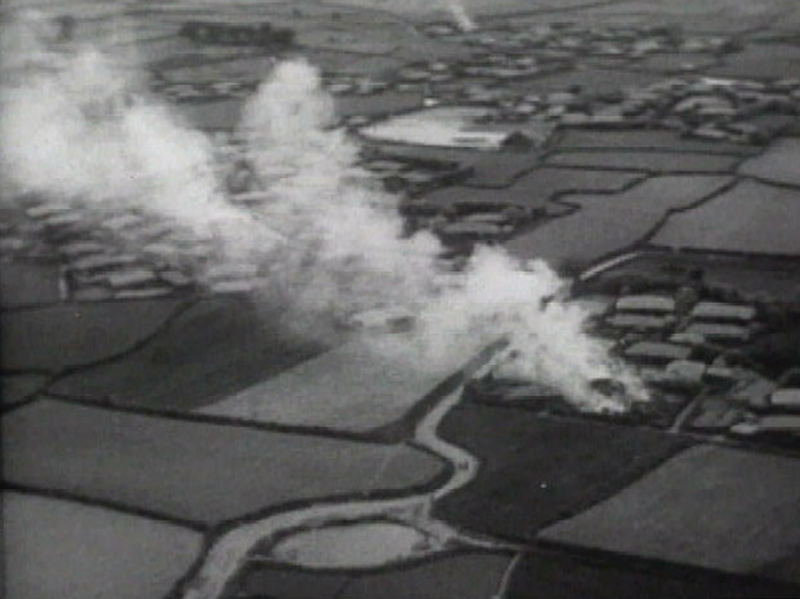 The arson attack of Ora-ri as filmed from the sky by the U.S. military. The police under the USAMGIK claimed the attacks against police stations on the morning of April 3, 1948, were committed by “Communists connected to the North.” However, many people believed this to be a false accusation. Public Prosecutor General Lee In stated that the root cause of the unrest was the unjust conduct of the USAMGIK. “The behaviour of the wicked officers of the U.S. military government was the major cause of the incident,” he said. The Korea Constabulary was reluctant to intervene as it identified the conflict as being between Jeju Islanders and the police and the Northwest Youth Association. However, the USAMGIK dismissed this characterization and ordered the Korea Constabulary, which was under its purview, to crack down on Jeju Islanders. About a month after the April 3 attacks, the Korean army executed the USAMGIK’s order. Meanwhile, Kim lk-ryeol, commander of the 9th Regiment, tried to resolve the situation peacefully. As a result, on April 28, less than a month after the attacks on the police stations, negotiations were set up with the armed resistance that had initiated the 4·3 Uprising. On April 28, 1948, 9th Regiment Commander Kim and Kim Dal-sam (real name Lee Seungjin), the head of the armed resistance group, reached a significant and potentially successful resolution after heated debate. They agreed upon a complete ceasefire within 72 hours in addition to gradual disarmament and safety guarantees for the armed resistance group. The April 3 Uprising and Massacre could have been avoided had these agreements been implemented. However, the peace agreement was sabotaged only three days later on May 1 when unidentified men disguised as members of the armed resistance set fire to Ora-ri village in what is known as “the Arson of Ora-ri.” The USAMGIK documented the arson attack from the sky and from the ground and it was used in a propaganda film titled “Cheju-Do May Day.” Although it was later found that that the arson was committed by members of the right-wing Northwest Youth Association, at the time it was attributed to the armed resistance and it resulted in the annulment of the peace agreement. On May 3, the civilians who descended from the mountain regions, trusting the peace agreement, were shot by police who were disguised as members of the armed resistance group. The violence was planned so that the armed resistance group would be blamed for breaking the ceasefire and annulling the peace agreement. 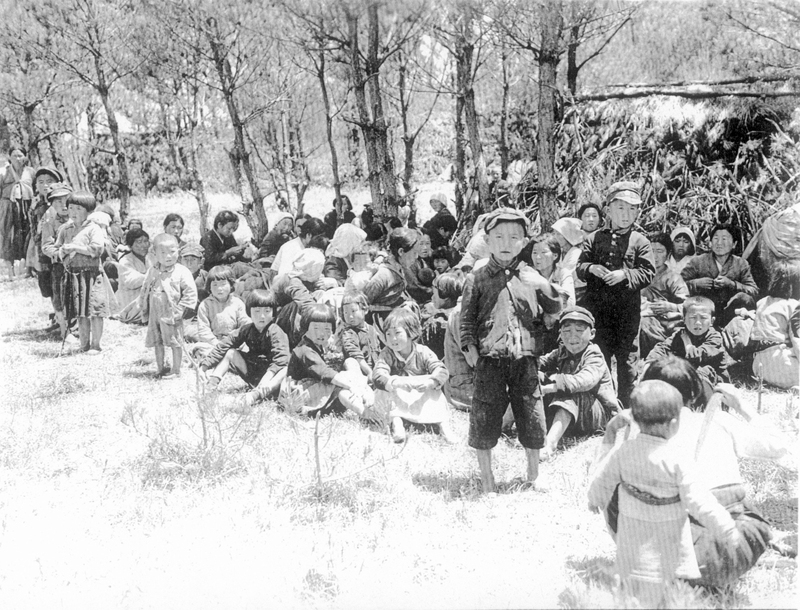 Jeju residents, mainly women and children, search for refuge in the island’s mountainous region from the government’s crackdown following Jeju’s boycott of the general election in May 1948.